13-14 February 2015, in Novograd-Volonsky of Zhytomyrska oblast, staff members of CBA Project’s Urban Development Unit participated in a professional training-seminar that was organized to improve the personnel professional skills and qualification. 12 staff members – Urban Development Officers of the CBA Urban Development Unit, will work in 24 partner cities assisting local communities in solving of local development issues and tasks in partnership with ‘Community Based Approach to Local Development’ Project. Novograd-Volynsky was selected intentionally as a place for the training-seminar. There are more than 320 multi apartment buildings in that city, in which owners of apartments united into associations (association of co-owners of multiapartment building - ACMB) and started to manage and maintain the buildings on their own. The participants of the training-seminar visited four of those associations: ACMB ‘Kedr’, ‘Koloryt’, ‘Chaika’, and ‘Komfort’, conversed with the Heads of the associations’ executive boards and learned about their experience in ACMB management and operations. The associations’ Heads of Executive Boards – Liubomyr Maletych, Anatoliy Legenchuk, Oleh Paletsky, and Serhiy Symonchuk – are very experienced professionals of this no easy but honorable work. Novograd-Volynsky municipal officials demonstrated high interest to the actual issues of legislation, ACMB functioning and development that were considered during the seminar. Therefore, in the seminar participated Serhiy Kolotov, Deputy Mayor of Novohrad-Volynsky, Svitlana Karpinska, Head of Economic analysis and planning department, Tetyana Levkivska, Specialist of Municipal initiatives and investments department of the municipality. 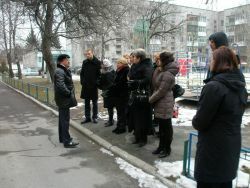 The training-seminar was organized and facilitated by Leonid Tulovsky, Urban Development Specialist of CBA Project.